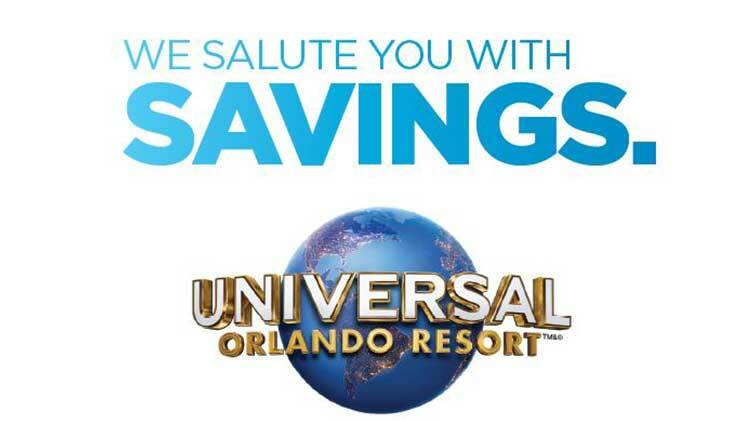 U.S. Service Members & DoD Cardholders: Get 4 Days for the Price of 1! Valid for purchase by Eligible Service Members including Active Duty (Army, Navy, Air Force, Marines, Coast Guard, National Guard and Reservists), Retired Military Service Members, DoD cardholders and/or spouses. Valid Military or DoD photo ID must be presented at any Universal Orlando™ theme park front gate window for tickets to be activated. Eligible Service Members and DoD cardholders are limited to the purchase and activation of six (6) promotional tickets. Offer available for purchase through December 28, 2018. Tickets must be used in full by December 31, 2018. Offer only available for purchase at Leisure Travel Services. For pricing and more info, call or stop by!